Current best savings from the Lawtons flyer: 2 / $5.50 Ruffles Potato Chips; $0.69 each Pepsi Products; $3.99 each Kraft Peanut Butter Assorted 1kg/Cheez Whiz 450g; 2 / $4.44 Ben’s Holsum Fresh Bread; $0.99 each Graves 100% Pure Apple Juice; $0.99 each Ganong Bagged Candy; 2 / $4.00 Campbell’s Chunky Soup; $0.99 each Catelli Pasta Assorted 500g/Meat Pasta Sauce 398ml; $0.69 each Avon Canned Vegetables; 2 / $4.00 Vachon Ah Caramel! 336g/ Jos Louis 324g/ Passion Flakie 294g; $2.99 each Cashmere Bathroom Tissue; $4.99 each Majesta Facial Tissues; $3.99 each L’Oréal Hair Expertise Haircare Products; $8.49 each Maybelline New York Volum’ Express Mascara; $3.99 each Axe Black Label Shower Gel Assorted 473ml/ Anti-Perspirant/Deodorant Assorted 76g – 85g/ Body Spray Assorted 113g/ Haircare Products; $1.99 each Degree Premium Anti-Perspirant/Deodorant; $11.99 each CeraVe Cleanser/Lotion Assorted 355ml/ Facial Lotion Assorted 89ml; $6.99 each Marc Anthony/Head & Shoulders Haircare Products; $0.99 each Act II Microwave Popcorn; 2 / $4.00 Quaker Granola Bars Chewy, Dipps; 2 / $4.00 Werther’s No Sugar Added Hard Candy; $0.99 each Compliments Canned Tomatoes; and more. 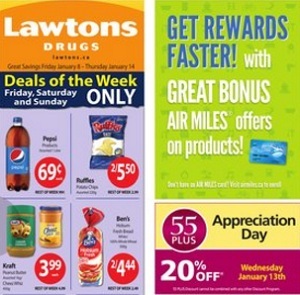 Find amazing prices in the latest Lawtons flyer for your local store.